Time management! We all want to be better at it right? Well, Host Jo-Ná shares a way artists can their work with all the things we need to get done in our businesses WHILE still being creative. This episode is really an honor. Today we speak to one of my favorite people on the planet, Angelica Ross. She's an activist, actress and powerful business leader paving the way for employment amongst transpeople with her incredible company, TransTech Social Enterprises. She talks to us today about her journey to becoming a highly sought-after actress and how her Buddhism plays a powerful role in her self-care and empowerment. Interviewing this powerhouse was such a treat. I even got emotional a bit on the show. From the boardroom, to film sets, to the White House, Angelica Ross is a leading figure of success and strength in the movement for trans and racial equality. Named, “1st Foot Soldier of the Year” in 2015 by Melissa Harris-Perry, Angelica Is the founder of TransTech Social Enterprises, a company that empowers trans and gender non-conforming people through on-the-job training in leadership and workplace skills. Angelica has toured nationally, speaking her powerful mission into action with business leaders, educators, and the President of the United States. Since studying theater at Florida Atlantic University, Angelica has been featured in film, television, and live theatre. Miss Ross is the breakout star of the upcoming series Her Story, which explores the deeply moving lives and loves of two trans women in LA. She stars as Candy as on the FX series, Pose. 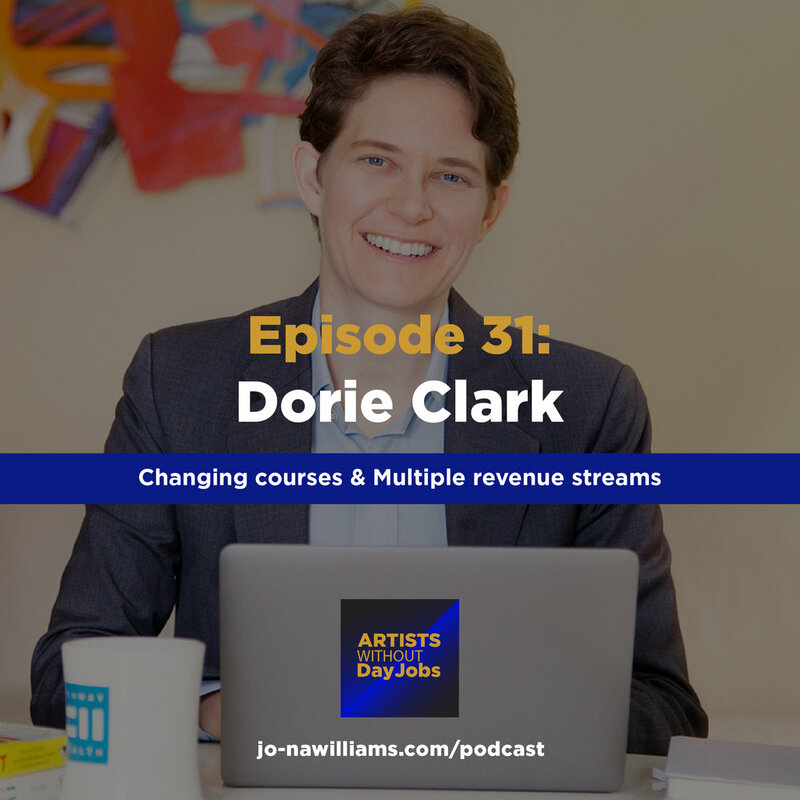 This week we hear the story of my good friend, Dorie Clark who not only transitioned out of her non-profit job and built a very successful business as an expert in reinvention, she also talks about how she's expanded her empire my creating multiple revenue streams and you can too! So much great info. Can't wait to hear what new revenue streams you build after listening! Today we discuss the one simple shift that I made when setting intentions for my life the has created HUGE changes in how quickly they manifest. Hint: It's a tip I learned from Mama Gena's School of Womanly Arts. Can't wait for you to use it and release attachment forever! Today we're talking to one of my absolute favorite artists and good friend, Danny Simmons! He shares how he went from a being a social worker to owning a full-on art empire and how you can too. So many gems in this episode! Daniel “Danny” Simmons, Jr. is an abstract-expressionist painter. Older brother of hip-hop impresario Russell Simmons and rapper Joseph Simmons (“Rev. Run” of Run DMC), he is the founder and Vice Chairman of the Rush Philanthropic Arts Foundation and Rush Arts Gallery. In addition, Simmons converted part of his loft in Brooklyn into the Corridor Gallery. Along with his brother Russell, Simmons established Def Poetry Jam, which has enjoyed long-running success on HBO. In 2004, Simmons published Three Days As The Crow Flies, a fictional account of the 1980’s New York art scene. He has also written a book of artwork and poetry called I Dreamed My People Were Calling But I Couldn’t Find My Way Home. Simmons is the son of Daniel Simmons, Sr., a truant officer and black history professor who also wrote poetry, and Evelyn Simmons, a teacher who painted as a hobby. He earned a degree in social work from New York University and a master’s in public finance from Long Island University. He began painting after he realized how much he hated his job with the Bureau of Child Support. Simmons, an abstract-expressionist painter, has had his work shown nationally. Chase Manhattan Bank, the United Nations, and the Schomburg Center for Black Culture all show his work as part of their collections. He is also an avid collector of African art and comic books. IF you want to connect with Danny check him out on Facebook.